The Money Bubble Bursts in the $400 NLHE Event! We are now down to 45 players in the $400 NLHE event and are officially in the money. All players are now guaranteed at least $873. Play will continue tonight until approximately 1am. Dan Voccia won the $600 NLHE event during the February Mega Stack Series and was going for back to back $600 NLHE event victories. He fell just short as he was just eliminated in 8th place and takes home $8,000. We are down to the final ten players in the $600 NLHE Deep Stack event. We are down to 13 players in the $600 NLHE event. The average chip stack is now just under 674,000. The players in the $600 NLHE event are now on a 75-minute dinner break. With 17 players remaining, the average chip stack is now just over 515,000. Final Two Tables of the $600 NLHE Event! We are down to 20 players in the $600 NLHE Deep Stack event and players are now redrawing for seats at the final two tables. The average chip stack is now 438,000. The players in the $400 NLHE Deep Stack event are now on a 75-minute dinner break. There are 131 players remaining and the average chip stack is just under 63,400. When play resumes after the dinner break, the blinds will be increased to 1,200-2,400 with a 300 ante. Congratulations to Ming Reslock, winner of the $400 Omaha Eight-or-Better event at the 2011 Foxwoods Poker Classic. Reslock takes home the trophy, leather jacket and $12,966 for first place. Foxwoods Poker Room Spokesperson Bernard Lee as well as Brian Lee were both eliminated on the same hand in the $600 NLHE Deep Stack event. They both take home $1,486. There are now only 35 players remaining. 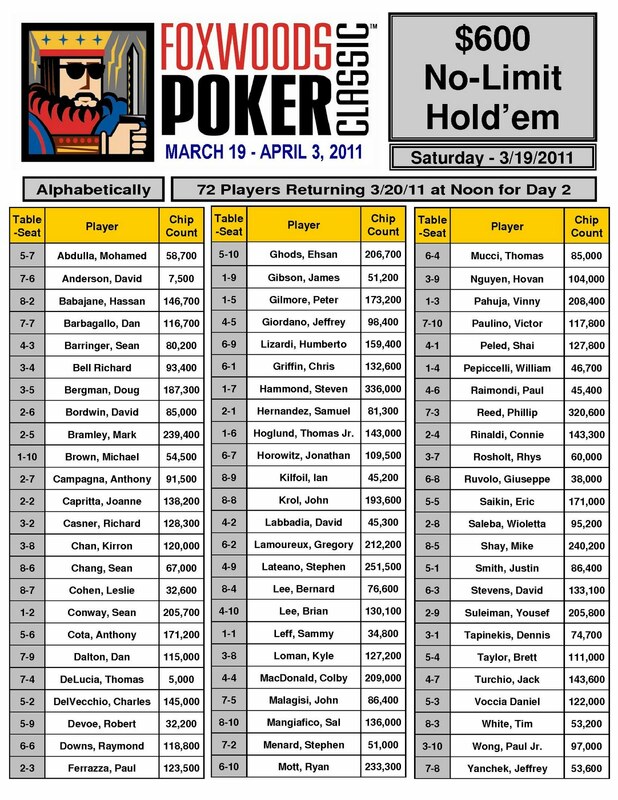 There are now only 45 players remaining in the $600 NLHE Deep Stack event at the 2011 Foxwoods Poker Classic. All players are now guaranteed at least $1,396 with first place paying $52,917. We are now down to the final 46 players with top 45 spots finishing in the money. Play has now gone hand for hand until one more player is eliminated. The players on Day 2 of the $600 Deep Stack are now on a 10-minute break. Tournament officials are coloring up all 100 chips. There are now 53 players remaining and the average chip stack is just over 165,000. There are nine players in the $400 Omaha Eight-or-Better event returning for Day 2. Play will resume at 2pm. We had a total of 415 players in the $400 NLHE Deep Stack event. $600 NLHE Day 2 Streaming Live! We are now live streaming Day 2 of the $600 NLHE Deep Stack event. Day 2 of the $600 Deep Stack Underway! Cards are in the air on Day 2 of the $600 NLHE Deep Stack event. There are currently 72 players remaining and the average chip stack is just under 121,700. $400 NLHE Deep Stack Event Underway! The $400 No-Limit Hold 'em Deep Stack event at the Foxwoods Poker Classic is now underway. Players are completing the final six hands of the night and then will be done with play on Day 1 of the $600 NLHE Deep Stack event. Play will resume tomorrow at noon and we will be providing live streaming coverage of the final day of action. 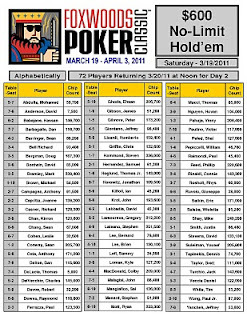 The final chip counts and Day 2 seat assignments will be posted here on FoxwoodsPoker.com as soon as they are available.